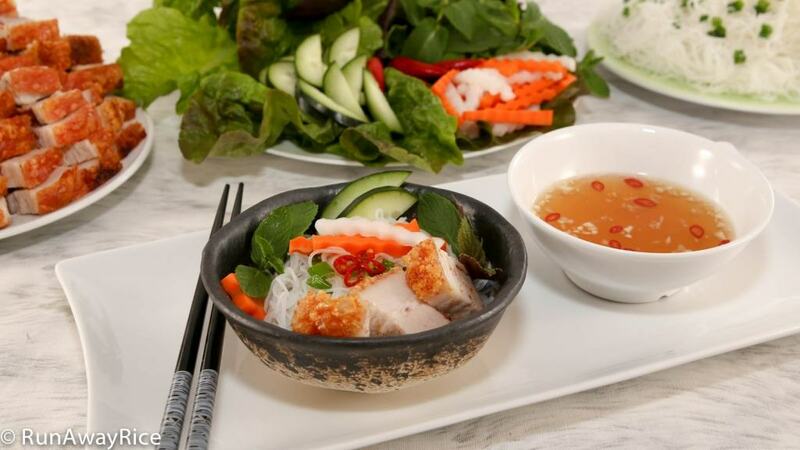 This no-fail recipe for Crispy Roast Pork (Thit Heo Quay) makes a perfectly puffy and crispy pork skin atop well-seasoned and juicy meat. I find most animal skins to be rather slimy and too fatty for consumption and so am not a fan. However, I break all the rules for this delectable dish. 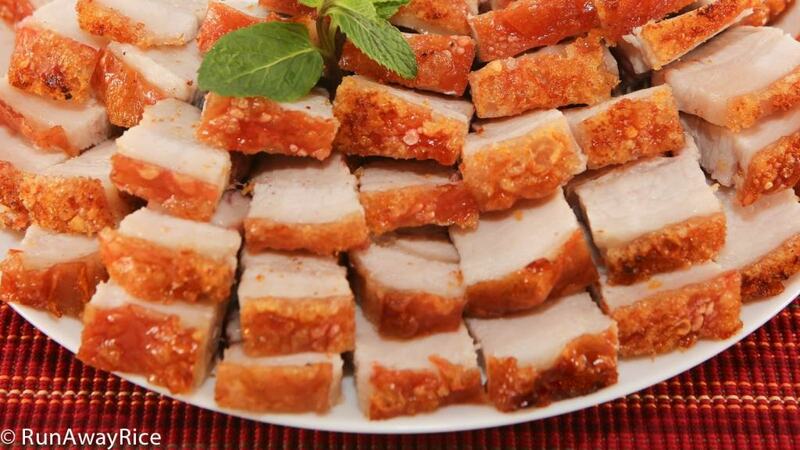 With its thick, crispy skin and juicy, savory meat roasted to perfection, Crispy Roast Pork is truly unique tasting. 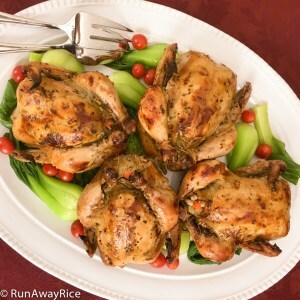 The recipe is simple with an easy-to-make and flavorful marinade. You can use any marinade you like but to get that distinct Asian roast pork flavor, be sure to use a little 5-spice powder and some soy sauce. To achieve the deliciously crispy and bubbly pork skin, there are numerous techniques with some yielding better results than others. So in this recipe, I’ve eliminated all of the guesswork. This is a no-fuss, no-fail recipe! The only work you have to do is to watch the timer and adjust the oven temperature as needed. It’s hardly work at all 🙂 Enjoy!! Watch the video for instructions. When buying pork belly, try to find a piece that has the same thickness all around. Also, examine the skin and make sure it doesn’t have any abrasions, markings or imbedded hairs. 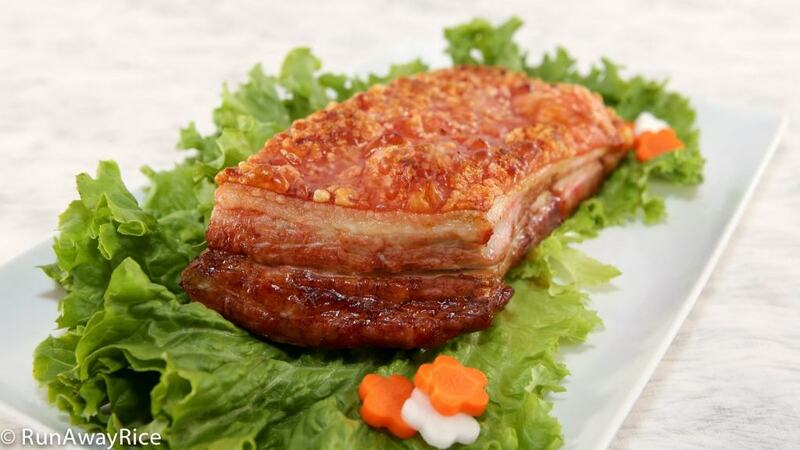 If frozen pork belly is all you can find, no worries, just make sure the pork is completely thawed before prepping. The red food coloring is optional. 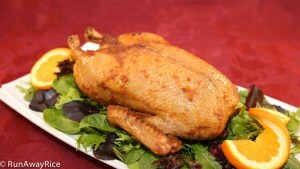 It gives the skin a nice rich color as does the roast pork seasoning mix used in the marinade. The marinade is enough for up to 3 lbs of pork belly. It’s ok if you don’t use all of the marinade so don’t drench the meat. Avoid getting the marinade on the pork skin. It will prevent the skin from getting crispy. The longer the meat is refrigerated, the drier the skin will be and the crispier the results after roasting. For even better results, let the pork rest in the refrigerator for 24 hours. Level the meat using folded pieces of foil placed underneath the meat. This helps the skin to brown and crisp evenly and you don’t have to stress if the pork belly isn’t perfectly even. Position the roasting pan in the oven so the meat is about 6-8 inches away from the top heating element. When the meat is fully cooked the internal temperature is approximately 160 degrees Fahrenheit. Cut up only the portion you plan to eat right away. Wrap up any uneaten amounts and store in the refrigerate for up to 1 week. 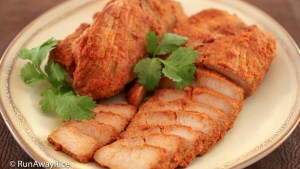 To reheat, warm the Crispy Roast Pork in the toaster oven at 325 degrees for 10 minutes. You’ll notice the skin will continue to crisp up when reheating. If you love super crispy skin, you’ll really enjoy these leftovers as the pork reheats really nicely. Freeze for up to 3 months. In a small bowl, combine 1 tsp of vinegar with 2 drops of red food coloring and set aside for now. In a measuring cup, add 5-spice powder, roast pork seasoning, oyster sauce, Hoisin sauce, soy sauce and Vodka 5-Spice Marinade and stir together. Sprinkle each side of the pork belly with 1 tsp salt and then rub into the meat. Rinse the pork with cool water washing off the salt. Pat the meat dry with paper towels. Place the pork skin side down on more paper towels. Make vertical cuts in the meat about 1/2-inch deep and 1-inch apart being careful not to cut to the skin. Trim if any loose or excess fat. Use a brush to coat the meat with the marinade making sure to work the marinade into the cuts made earlier. Apply the marinade to the meat only and avoid getting the marinade on the pork skin. Place the pork with the skin side up into a large baking dish or plate. Brush more marinade onto the sides of the pork belly, again, being careful not to get any on the skin. Sprinkle salt and gently rub into the skin. Brush the skin with the vinegar and red food coloring solution prepared earlier. Place the uncovered baking dish into the refrigerator and allow to marinate for at least 8 hours. Remove from the refrigerator and allow to come to room temperature for at least 30 minutes before roasting. Preheat the oven to 325 degrees Fahrenheit. Pour 1 cup water into the bottom of a roasting pan. Place the pork belly skin side up onto the roasting pan. If the pork belly has an uneven thickness, place folded pieces of foil underneath the meat to level it. Brush the skin with a thin layer of vinegar. Place the roasting pan into the oven and roast for 30 minutes. Adjust the temperature to 325 degrees Fahrenheit again and roast for 15 minutes. Turn the oven to Broil again and roast for 5-10 minutes until the skin has lots of crispy bubbles and is golden brown. Cut the Crispy Roast Pork into strips following the cuts made earlier. Chop the meat into bite-sized pieces. Wrap up any uneaten amounts and store in the refrigerate for up to 1 week. Freeze for up to 3 months. I wonder what happen if I skip the roasting pan and water and just put the pork on a baking tray instead? Thank you! You can give it a try. Sometimes the drippings get burnt in the pan. The water helps to prevent the smoke detector from going off and making the pan easier to clean. Enjoy the recipe! I made the roast pork today for a party and it was so good. I tried other recipes before but yours is the easiest, tastiest, and crispiest. Everyone was so impressed. Thank you! Bake: 400F 45’, lowest rack. Brush the skin with mixture of vinegar + water (1T vinegar + 3 T water). After 10′ brush one more time. Change to broil & move it to the middle rack until the skin turns to crispy & golden brown. Yes, it passed down from my aunt. I made a few times but your instructions of baking is so clear. I just noted that if I used only vinegar, it seems to crispy at first but it gets harder in an hour, so we always mixed with water. I only lightly pad the skin last with whatever left of the seasons on my glove without brushing the vinegar before overnight the meat. Also, before baking, use a needle to punch the skin (about 1/2 inch a part), this helps it to get crispier. Can you please explain, how. Many times you brush the vinegar? What does after 10′ mean? First of all just want to thank you for you for your great energy! Really admire your effort and passion! I really like the way you thought about the vertical cuts of the meat. It was an excellent idea Trang!